The ankle joint is composed of the tibia (larger leg bone), the fibula (smaller leg bone), and the talus (foot bone). These bones are connected by ligaments which are not visible on routine x-rays. The ankle joint allows up and down (dorsiflexion & plantarflexion) motion of the foot. The foot is composed on 26 bones connected by ligaments. 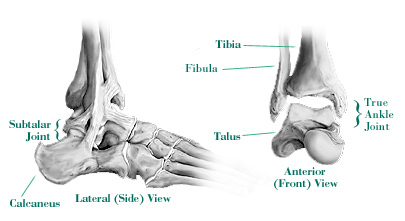 The talus is the first bone and is part of the ankle joint. Below the talus is the calcaneus (heel bone). The joint between the talus and calcaneus is the subtalar joint. This joint allows the foot to move in and out (inversion & eversion). The foot is divided into 3 sections: the hindfoot (subtalar joint and transverse tarsal joints), the midfoot, and the forefoot (ball of the foot and toes). Injuries to the ligaments of the foot and ankle are called sprains. Ankle sprains are common sports related injuries occurring with excessive inversion of the hindfoot and ankle. Fractures (or broken bones) occur in the foot and ankle. These are treated with a variety of methods depending on the location and extent of the injury: symptomatic treatment (no treatment other than to control symptoms), surgical shoe, boot, cast, or surgery. Arthritis affects the ankle, hindfoot, midfoot, and forefoot. It is a loss of cartilage in the joint causing friction, inflammation, and pain. Foot Pain—Where does it hurt?